Dan Martinez is an accomplished Navajo silversmith who works in the Traditional Revival style. He is best known for his concha belts. 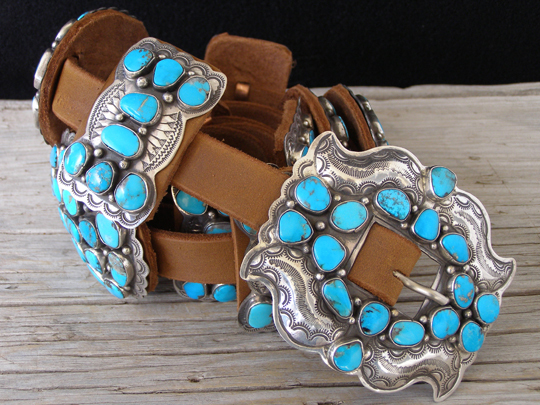 This is traditional Navajo concha belt richly-laden with free-form stones of natural, untreated Kingman turquoise. Each of the five large oval conchas is encrusted with sixteen or seventeen stones, while each of the six butterfly conchas is set with eight stones. These are rich, bright blue stones. The large buckle is set with another sixteen stones. The conchas, both oval and butterfly, are leather-backed. The conchas, in classic fashion, are attached to the three-quarters-inch-wide leather belt strip by copper bands. This is the essence of a traditional Navajo concha belt to be worn with a long blouse. This is made in the style of yesteryear with a patina that lends an aspect of age to the belt from the outset. This is meant to ride at the hips and can be worn loose. This can be adjusted to around 30" in length as the shortest length and can be easily adjusted to a larger size while maintaining the richness of the belt. After adjusting the placement of the conchas with the directions provided, holes can be punched in the leather to achieve the desired customized fit. Hallmarked DM and stamped Sterling on the back of the buckle. Dimensions of buckle: 3 1/2" x 2 7/8"
Oval conchas: 3" x 2 1/2"
Butterfly conchas: 1 1/2" x 2 7/8"
Stones: range in size from 3/8" x 5/16" to 5/8" x 3/8"
Width of leather strip: 3/4"